what a spectacular job from Victoria - the whole family. She had to wear three formal dresses and each one is just perfect. At the ceremony - the red ball gown - I love it and the jewelry is perfect. The blue dress at the King's dinner - lovely. Real knockout though with the gold dress at the major dinner. Regal in every way. Madeline is a pretty woman and so glad she gave up the blonde look. Like the pink dress she wears to the ceremony the best - wow those amethysts (?) the earrings and brooch - very nice. 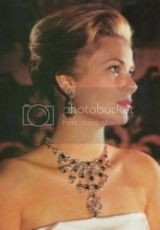 And of course Momma who loves her sapphire parure - who could blame her? Sofia looked cheap - sorry - the dress just looks wrong. 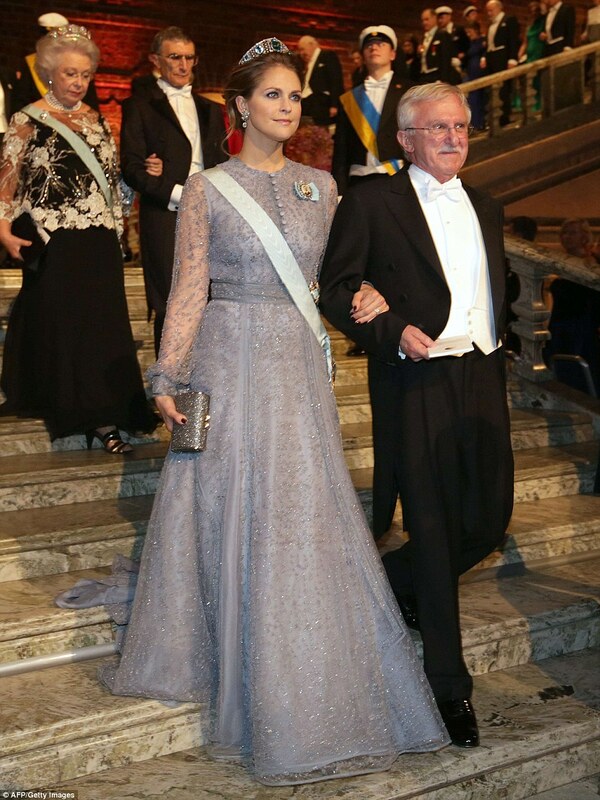 ^^Those Swedish women really know how to rock the gowns and jewels. (I am excluding the newest member, naturally). 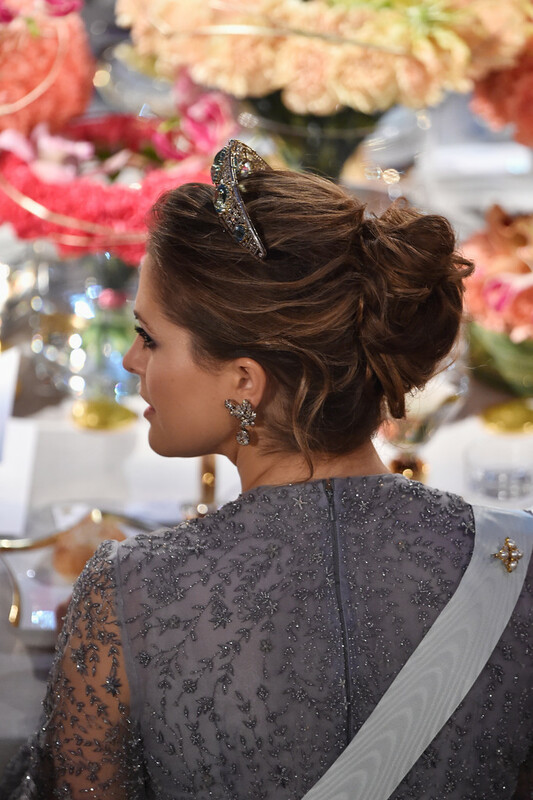 They have the best updos for tiaras. The others could upgrade their hairstylists. So this year except the monarchs and the crown princes couple the rest are seated with the plebs. I don't know why they cannot keep CP and Madde up in the scenario and their partners down. At least until Estelle and sibling attend. ^ Ah, Victoria is a lovely pregnant woman; Silvia is stately (even though that shot under the lights wasn't the best for her face) -- both with excellent tiaras. Sofia does not fail to disappoint in her cracker box tiara and tacky dress, grinning into the crowd as if it were all about her. 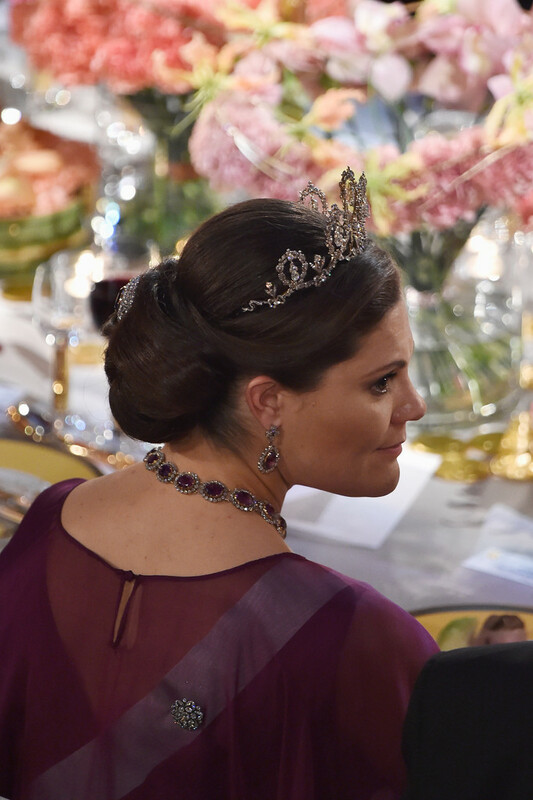 And Madeleine was honored with a new tiara. Take that, Sofia! I'm not sure about any of the dresses. Victoria's nice but nothing to talk about. I love the fabric of Madde's but not sure about the neckline. Sofia's skirt doesn't suit a pregnant woman. Madde's tiara is supposedly owned by one of her aunts so it must be a loan. It's sad because she is the one who looks best in aquamarines of the family. Apparently, Crown Princess Victoria has requested a gluten-free meal this evening, while Princess Sofia has requested a vegetarian plate. I'm with Alex on this one. Not a fan of any of the dresses. They're far too much or something and not particularly flattering. The Queen looks warm and motherly to me and I love her tiara. The King is a jerk as always, walking ahead when his wife struggles on the step. Victoria looks better in movement and I love her tiara and the jewel in her bun. She's at that puffy stage of pregnancy and so a repeat of that fabulous red dress last year just wasn't going to happen this year. She wore what worked. Sofia is ridiculous in her small, shiny tiara and stopping to grin and wave at someone as if she were celebrity at the Oscar's. She stopped the flow of the procession and Chris and Maddie almost bumped into them. I bet Maddie was ready to drop kick her into the banquet hall. I think Madeleine is by far the best dressed this year. Her tiara is wonderful and her dress is very elegant. ^ Yes, love the hair and tiaras! Sofia was the only one of the royal women who had to pick up her dress to her knees to walk down the stairs. Reminiscent of her mother at the wedding . . . .
Don't they do that in Hollywood? I mean in those 'E red carpet' things they flash the shoes all the time. ^If I was pregnant, I'd hold my skirt up, too, to avoid tripping, so I agree. It's a no-brainer, to me. And this pregnant woman is a former model, so she should be used to . . . oops! She modeled without clothes. I guess that's the problem. It's much easier to walk down stairs when you're naked. And, yes, celebrities do all kinds of things and show off all kinds of stuff on the red carpet. Sofia wants to be a celebrity. She'll learn. 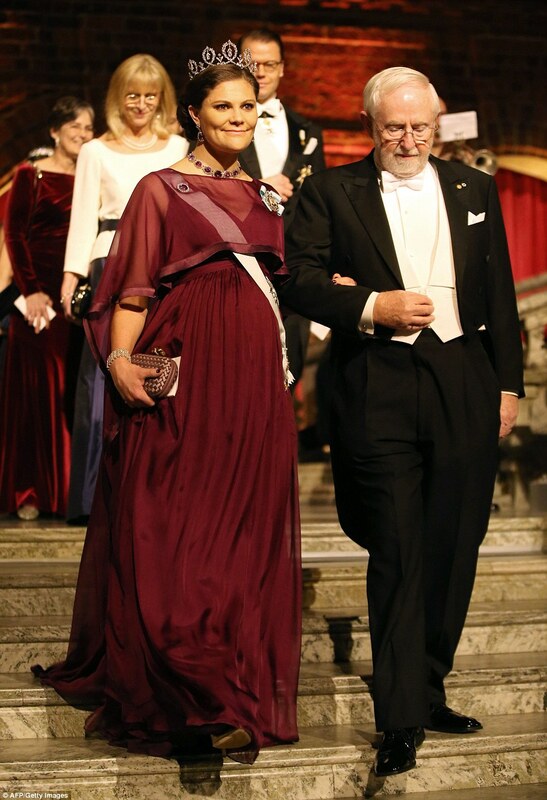 The Royal Family at the dinner for the Nobel Prize Laurates at the Royal Palace. ^I like the blue color a lot on Victoria and think she looks lovely as does Sofia; great choice for her. ^^ I like the deep blue on the Queen and Victoria. Both improved from last night, I think. Madeliene has a silver theme going on this year, evidently. I really like it. And Sofia looks better than she has. Still stuck with the prom tiara, though.